Today I'd like to share a knitting project with you! This is the Citron Grand shawl pattern, and I'm knitting it in merino lace-weight yarn that I spun up from a Jill Draper gradient roving (you can see and read about the roving in this post!). It's a simple, easy pattern, perfect for car-knitting and taking to knitting group. I'm calling it my Moonpie Shawl because of the silvery blue-grey color of a lot of the yarn. I'm just moving into that color and you can see it along the edge of the shawl. It reminds me of moonlight on the ocean and I love, love, love it. I'm only about halfway through the pattern, so this is going to be a big shawl, and I may end up adding more sections because I want to make sure to use up all the yarn so I get all the way through the purple color at the end. It's on a size 6 needle, though, so it's still light and airy. I'm going to be spending my afternoon knitting and drinking tea and snuggling with the kitties (by which I mean, trying to keep my yarn away from their adorable but grabby little paws!). What projects are you working on? By the way, if you're on Ravelry, I'm JulieRoseSews on there as well-- feel free to friend me, I love seeing all of your beautiful projects! Gorgeous! Wish I could knit! Thanks so much, Victoria! Your crochet work is gorgeous, I'm sure you'd pick up knitting in a snap. This is so beautiful! There is something so rewarding about knitting or crocheting with yarn you spun! I cannot wait to see it finished! Aw, thank you, Grace! Making things with handspun is such a cool experience. When anyone asks me what yarn it is, it's so much fun being able to say, "It's my handspun!" I love that you are knitting with your own handspun! Isn't it so much fun to do that? 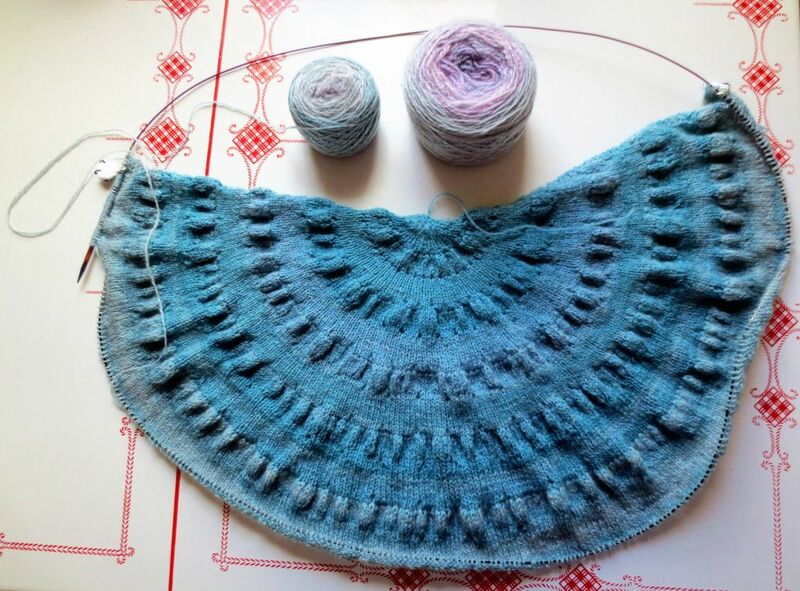 I love the shawl, the pattern and yarn are a perfect match. It is so much fun! Thank you so much for the compliments, Miss Pumpkin! I couldn't do anything too lacy because I need to fit in all 1200 yards of yarn while keeping the size manageable, and the pattern is just interesting enough to be fun while not being too complicated to knit while chatting at knitting group.